Orginal red and grey canvas wall art elegant and gentle Red and Grey Poppy Flower with breathtaking beauty is the angel and the devil incarnate. Red and Grey Poppy artwork represent consolation . 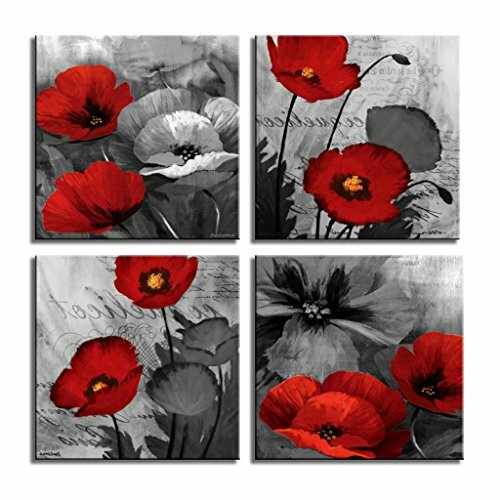 Poppy canvas wall art size:12x36Inch(5 Panel Combination Total).Package:Poppy canvas wall art 1 Set/box. Sincerely suggests: When you buy, please make sure your products are supplied by LKY ART. 1.Red and Grey Poppy Flower Wall Decor Artwork Give You A Special Feeling Day By Day.Full Size:12x12Inch(4 Panel Combination Total).Package:1 Set/box. 2.Red and Grey 4 Piece Canvas Wall Art For Living Room Decor,Bathroom Decor,Bedroom Decor,Living Room Decor,Office Decor,Lounge Decor,Coffee Bar Decor,Hotel Decor,TV wall Decor etc. 3.Red and Grey poppy canvas wall art packed in carton box, stretched with wooden frame on the back and ready to hang. 4.Red and Grey Artworks stored in Amazon warehouse in US and deliver to your hand in 1-3 days by Amazon directly. 5.Great service: Any question, pls contact us, we will come to you within 8 hours. Every customer's helpful suggestion is appreciated, hope we can be better and better under the impact of your advice. If you have any questions about this product by LKY ART, contact us by completing and submitting the form below. If you are looking for a specif part number, please include it with your message.